Pies Etc. 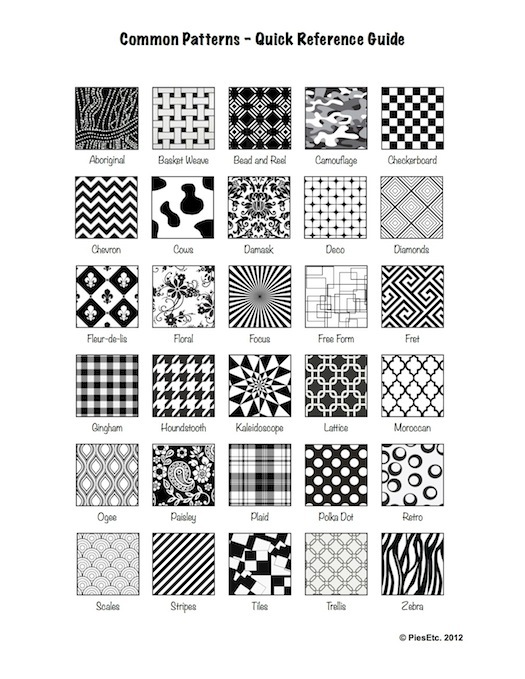 : Free PDF - Quick Reference Guide to Common Patterns! Free PDF - Quick Reference Guide to Common Patterns! While tooling around my pretty new MacBook Air (I recently kicked to the curb gave my father my old, white MacBook circa 2006) and teaching myself the ins and outs of Numbers and Pages, I created this - a quick reference guide to some common design patterns. Why this on a pie blog? Well, why not? Sometimes you just really need to know what Damask looks like. Feel free to copy/pin/use this for all your designing purposes, or email me at mary@piesetc.com if you'd like a larger PDF; just make sure to always give credit where credit is due!